See the Ball Mountain Lake website for additional information. Primary recreational opportunities are listed below. Directions: From Brattleboro, north on VT 30 to Jamaica to dam. The campground is 5 miles north of the dam, off VT 100. Factoid: Part of the Connecticut River Anadromous Fish Restoration Program, Atlantic salmon are stocked and smallmouth bass and trout fishing is available. 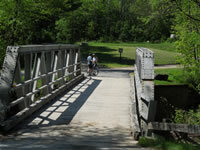 Winhall Brook Campground near South Londonderry features 111 campsites. Fees apply for some facilities. Both summer and winter recreation activities are popular with park visitors. For up-to-date information, call (802) 874-4881.